To better understand why a guardhouse layout is important, we should first define what the guardhouse layout is. The guard house design layouts can be defined as the dimensions of the guard house itself, meaning the length and width of the building, as well as the location of the door and windows or other options chosen for the structure. The layout is important because it becomes the definition of what your company or business needs it to be for the setting where it will be located. When choosing a security guardhouse, it is important to select and style a guardhouse just the way that is suitable for your custom needs. For this reason, many details go into the design and layout of the guardhouse and its design aspects. This may be the first time you or someone in your company has considered the potential of a guardhouse or prefab guard house for your facility or site. Hopefully, the factors listed above will be helpful and assist you in your planning. It is very important to become informed on guardhouse layouts, designs and plans that are available to you and your company. Searching for a guardhouse layout can be a daunting task in and of itself, however yours may be a very set design layout as you may have already settled on a very specific plan for your company guardhouse. Either way, the fact remains that it is very important to put your company in touch with a guardhouse layout that is customized specifically for you and that works most effectively for your business platform. Georgia Portable Buildings, Inc. has many guardhouse layouts, designs and plans which have been effectively customized for companies and businesses and clients. Due to this fact, it is possible for you to see these layouts and determine which designs have worked for previous clients in comparable scenarios. These designs can prove to be effective as possible guardhouse layouts that may work within your company scenario. In order to explain and illustrate how these plans or designs may be helpful to your company, an experienced Georgia Portable Buildings, Inc. designer can speak with a member of your company to assist with the guardhouse design process so that the planning stage does not have to be a difficult or daunting task. 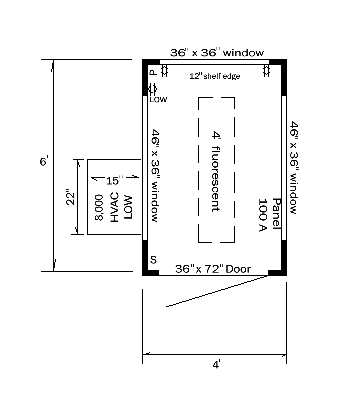 What type of guardhouse layouts may be the best for you? Do you need a simple and minimal guard building for gate check-ins? Would you prefer a guardhouse design layout that is more advanced and has a restroom and closed circuit monitors? 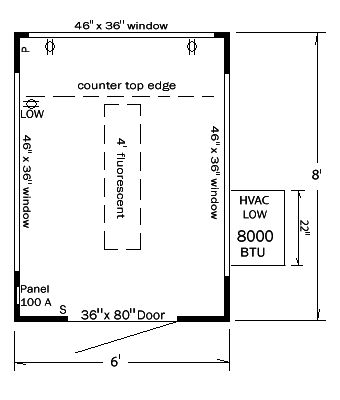 Perhaps your business requires a guard house plan somewhere in between these layouts and you need a standard design. Whatever it is you have in mind or even if you are not sure yet which guardhouse design you may need, the representatives at Georgia Portable Buildings, Inc. are happy to help. Allowing Georgia Portable Buildings, Inc.’s experienced staff to assist with guardhouse design plans can save much time, money and potential difficulties in the future. Strategically placed guardhouse windows, safety design features, even air conditioning and heating or wiring and lighting components within the layout can all be beneficial to guardhouse custom design. 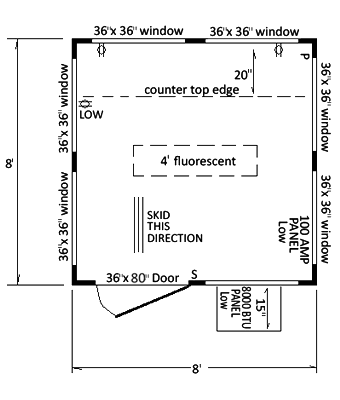 Guardhouse layouts are important to the safety of a business. This is so because a company wants guardhouse designs that are up to date and effective against deterring crime and increasing safety for staff and others. If a guardhouse is designed properly, it can greatly enhance the safety and security of a business or company location where it is placed. The layout of the guard house is important because it should maximize the view for the security staff members in all ways. The window placement should allow for the best view during the day, if the guard shack is used at that time. 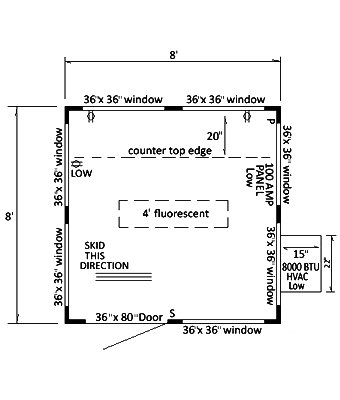 Also, and most importantly, the window layout in the guardhouse is vital at night. Other aspects of the guardhouse layout are important as well, such as door placement and other security features of a guardhouse. Your guardhouse could include in its layout other design features such as extra or additional countertop space, HVAC, additional electrical receptacles, additional light switches or receptacles, optional door choices and more. See A Guard House Design You Like? Your guardhouse layout includes information on the workmanship of these fine buildings. The guardhouses are built with ¾ inch pressure treated plywood floors and pressure treated floor joists on 16” centers. The interior guardhouse floor design features insulated r-5 floors and quality vinyl flooring over ¾” premium osb. The warranty information on the guardhouses as well as the delivery and installation is excellent and worth checking into as well. The representatives at Georgia Portable Buildings, Inc are familiar with all details of guardhouses and can provide you with specifics regarding layout details so that you can receive a specific price quote. A well-designed security guard booth with a smart layout can make a big difference in warding off security risks and safety dangers. Having a secure location for a security staff member is a good feeling. Knowing that your business site is protected during the dark hours with a guardhouse that has been well designed and has a custom layout helps any business owner feel better. Planning in advance to be assured that your business area is as safe as possible with a securely designed guardhouse layout that you have planned and had part in designing can bring real peace of mind. 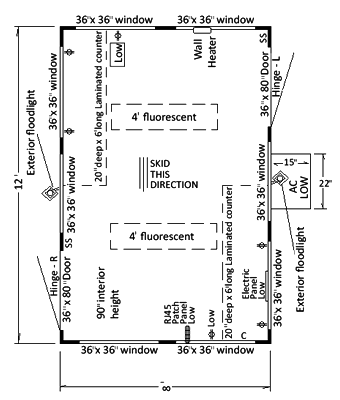 SA well-lit and well-positioned guardhouse makes a dark business lot or construction site a much safer area at night. If your business requires a safety check at night or you are responsible for a temporary construction area, you may consider the possibility of planning the layout of a guardhouse. Knowing the construction industry and the risks of security at night in those areas, you know the importance of keeping that type of site or location guarded, protected and safe. The more planning and advanced customized layout preparation, the better. 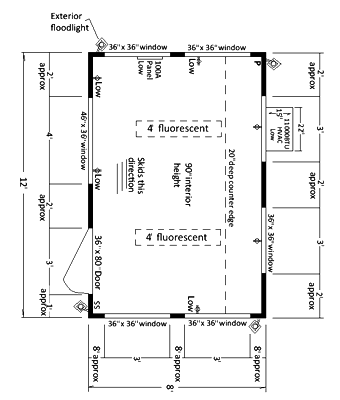 You may find that a pre-planned security guardhouse layout is something your company decides is right for them. Visibility: Will the guard be sitting at a counter? Which direction will the person face? Where should the door be situated? Where will any monitors be placed? 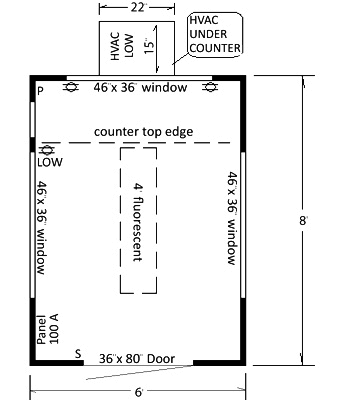 Counter space: How many monitors and what size will be placed on the counter? 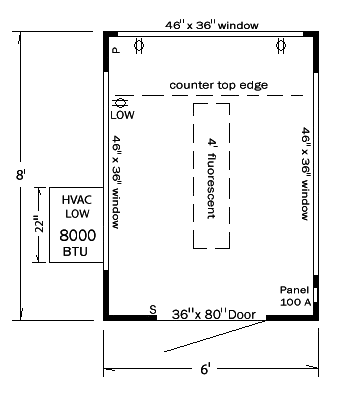 Should the counters be 12” deep, 16” deep or larger? Will someone have to reach over the counter to pass paperwork through a window? A deep counter may not be a good option. Do you have a number of officers that carry 2 way radios? If so, will they charge batteries at the guard house? If so, how much counter space will they require and how many electric outlets will be needed for that purpose? 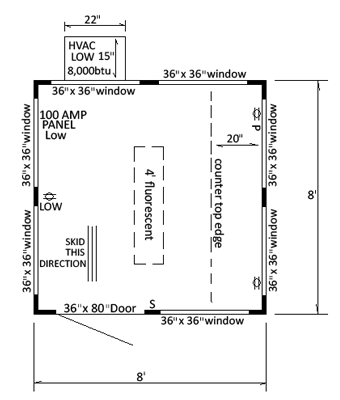 Electrical issues: Where will the electric panel be located? 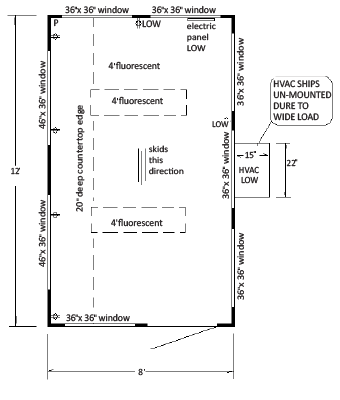 It is usually most economical to place the panel on the side of the building close to the incoming power source. Where are the most convenient places to install duplex receptacles? Don’t forget to consider if there is a need for any 220V receptacles. 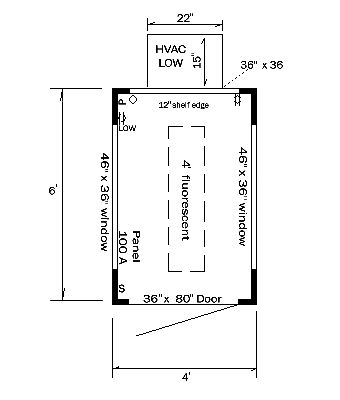 Is there a need for exterior outlets? Windows: Double pane is usually always best. Do they all need to open? Should they slide up and down, or side to side? Will a guard be seated while passing paperwork through the window? Should that window be small or large? Phone and Computer issues: Do you need Cat 6 cable? Phone jacks? If so, how many and at what location? HVAC choices: Wall mounted electric heaters are good for some small guardhouses. Floor mounted baseboard heaters are a quiet, consistent source of heat. Don’t forget that they can be damaged if in a direct line of a rolling chair or stool. Wall mounted heat pumps will likely not be enough if you are in an area subject to really cold weather. What size do you need? How often is the door or window going to be opened? In a small guardhouse, that is often an important factor. Wall mounted air conditioners are usually the least expensive option for cooling, but will the outside protrude into a vehicle or pedestrian traffic area? Doors: A regular hinged door with a window is the least expensive option. Should the door swing in or out? Also, will the guard be passing material through an open door to vehicular traffic? Then, a sliding glass door might be a better option. Sliding doors usually have an active, or sliding side and an inactive side. Which side should be active? Exterior appearance and color: Often the security department staff is most concerned with issues of efficiency, function, safety and security. That is as it should be. Just bear in mind that there may be others in your facility that will be more concerned with color and appearance than function. Failure to consider this can end up in the rejection of a good proposal and send you back to square one. DDesigning a guardhouse with a well thought out plan in advance makes sense in order to cut costs as well as prevent unwanted thievery. One of the reasons this could be so is because a guardhouse in itself can prevent thievery but a well-designed guardhouse with an advanced layout allows the owner to be a step ahead of crime. Business owners can cut costs by planning their guardhouse layouts so that their security staff is well cared for and comfortable within the security structure. Each area of square footage and space can be used wisely and provide just the right amount of area for the proper function of the security officer. Another plus is the fact that heating and air conditioning can be designed for the climate in your area. A properly laid out heat and air system can provide comfort for the occupants. 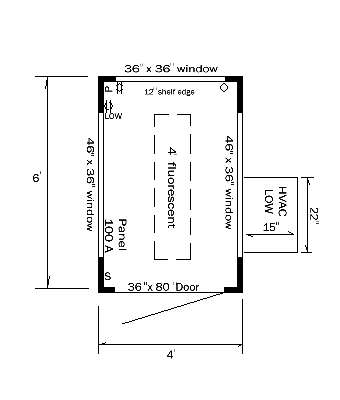 The nice thing about working with Georgia Portable Buildings is the staff enjoys helping others come up with the perfect layout for your needs. Over 27 years in the industry gives them the confidence to ask you the right questions. Questions that can lead you to the best solution. The company has experience with custom built guardhouse projects for business locations both large and small. Every time they sit down to work with a client to develop a guardhouse layout design, they customize each individual plan and take into consideration the needs of each individual client. Georgia Portable Buildings, Inc. would be more than happy to assist you in creating a customized guardhouse layout that maximizes design features for your company, increasing the level of safety all around while saving you money.